Marvel Avengers Iron Man 12" Figure Just $6.47! Down From $19! 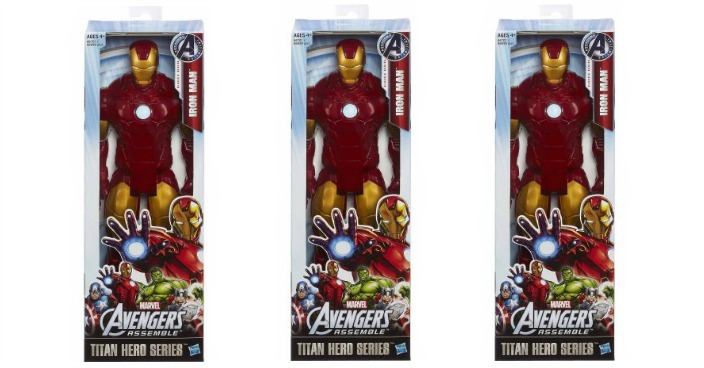 You are here: Home / Great Deals / Marvel Avengers Iron Man 12″ Figure Just $6.47! Down From $19! Marvel Avengers Iron Man 12″ Figure Just $6.47! Down From $19! Right now you can get this Marvel Avengers Iron Man 12″ Figure on sale for $6.47 (Reg. $19) at Walmart! Nothing on Earth is more powerful than the incredible Iron Man! His supersonic suit blasts through the sky armed with incredible energy weapons and super strength. No matter where in the world the bad guys are hiding, Iron Man is ready to zoom in and blast ’em! Super-size your superhero adventures with the armored Avenger! This Titan Hero Series Iron Man figure has a “supersonic” suit and he’s ready to open up a repulsor-blasting attack on the foes of justice everywhere. With him on your side, there’s no telling where your Avengers adventures will take you!